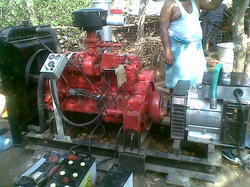 Leading Manufacturer of 100% gas base generator from Varanasi. We are a remarkable entity, involved in offering an excellent quality range of 100% Gas Base Generator. The offered gas base generator is used for diverse industry applications due to its sturdy construction, compact design, user friendly operations and reliable performance. Operated with diverse types of gases like natural gas, this generator is developed to produce maximum electricity and thermal power. Looking for Gas Generators ?